When ‘off-the-shelf’ is the best solution. This was a lesson in checking our pride at the door. The team at Perception Integrate are masters at sourcing efficient solutions to meet the needs of our clients. We take into consideration the clients budget along side their expectations. As our name suggests, we prefer a fully integrated approach but there are times when we are tasked with a retro-fit, or low budget challenge that requires an ‘off-the-shelf’ solution to perform a necessary function. 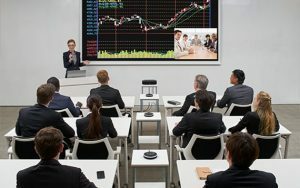 One such project involved a client who had invested in a new VC codec and screen, without considering the incoming or outgoing audio requirements for their boardroom. The supplier they used was a distributor only and therefore had no actual professional service offering. Essentially the supplier was just shifting boxes. They approached us needing a solution but with an already exhausted budget we knew from the start that a traditional approach could not be adopted (DSP, VOIP card with table microphones, surface and flush mount speakers..) so we investigated options that would provide these functions for both VC and AC and it would have to be a cost-effective and retro-fit (non intrusive) solution. After investigation we found the YVC 1000, distributed by Revolabs, to be the perfect fit. The system is supplied as standard with 1 x omni directional microphone and the base unit with onboard DSP and Yamaha speaker. Additional omni directional microphones can simply be added onto the base unit to provide full table pickup, so we added an additional 2 microphones to the system, making it 3 in total. The base unit has a Bluetooth function which pairs with any mobile phone and enables AC via the system. The solution was sold at just over 1K, and was very well received by our client. Our team tend to adopt a traditional approach when it comes to audio and integration. However, this exercise was a lesson in pride! The ‘all-in-one boxed off-the-shelf ‘ approach to an AC and VC audio solution was the best one for our client, as it suited the budget, the room style, and all the clients expectations.